My beloved singing nightingale that came into my life in May, 2011, has found a new, permanent nest. 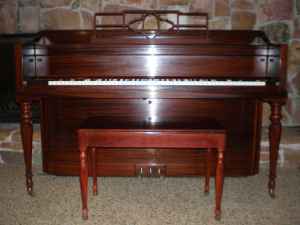 About 4 years ago I stumbled upon “Haddy” while browsing a Fresno, California Craig’s Listing (by owner, used piano sales) It wasn’t that I needed another piano to join a growing family of Steinways but I was curious about an eye-catching console that had the exotic name, Haddorff. And since it resided around the corner, I simply arranged to see/play it just to purge myself of a growing obsession. ESP or well-developed intuition bore out. I was led to a beautifully voiced and regulated piano that commanded my undivided attention. Gliding over its keys, blissfully enjoying its enviable resonance, I experienced a piano that begged to join my lovely brood of keyboard instruments. And though I possessed a modest living space, there was yet room for one more addition, especially since it had the look and feel of a piano perfectly crafted for younger students. $700 dollars down, and this heaven-sent piano was mine. With a preliminary tuning and inspection at its point of origin, the best laid plans were made for its relocation. The mover, Ginaddy, who owned a piano store that had sadly gone belly up, accomplished the most incredible solo move I’d ever witnessed…on a dolly, with a breathtaking set of wheelies, he convened a rollicking journey IN THE STREET as cars stopped, and passersby gazed at his awesome escapade. Once over the last bump before settling in, Haddy spent the next few years with me in Fresno, and the children flocked to her, avoiding the big Steinway grand, and sister upright. They gravitated to “Haddy” only, hardlly budging on the bench while Aiden cat snugly bonded to them through scorching Valley temps. For me, Haddy was a great springboard for imparting an analysis of Bach Invention 1 in C Major– Its voice rang out at just the right volume and timbre. With a sterling C.V. and growing reputation, Haddy, was surely destined to become a fixture in my Fresno repository of keyboards, though in time, my eventual relocation to Berkeley, CA, came with a necessary sizing down of pianos. In fact, my new digs in the East Bay could barely accommodate a Steinway upright and grand, let alone a Yamaha digital console. So where was Haddy to be put amidst a crush of pianos? Unfortunately, Haddy had to find a new home, and I knew it must be with an owner who’d cradle and well-maintain her forever! Within weeks of painstaking inquiries, I found the perfect partner for Haddy. She was Karen, a piano teacher colleague whom I had known over years through our local MTAC, and because needed a second piano in her Clovis home studio, the arrangement worked. That said, Haddy enjoyed more than two years in the Central Valley, until an email arrived from its caretaker mentioning a dramatic change in circumstances that foreshadowed Haddy’s imminent orphanhood. Could I take Haddy back and squeeze her into a corner? My pea-pod size apartment was becoming hazardous to walk through. I had already tripped on a sea of entangled wires and cables, careening into the wall, incurring a golf-size hematoma. And my grand pianos had no easy access, so I found myself crawling under them to get to the kitchen. For sure, Haddy would not have a secure and safe presence in my household. In the nick of time, I thought of a former El Cerrito-based adult student, (Irma) who had given up piano lessons, but still had a hankering to play at her leisure. And at the time she quit, I had taken back my Baldwin Hamilton grand that I had loaned her. Over 24 testy hours, I located Hans Oviedo, whom I had known from my years in Fresno, and together we mobilized Haddy’s relocation the East Bay. Oviedo, who earned himself a sterling reputation building up the local piano store, Valley Music Center, owned a tenacity I could admire, and now having the Steinway dealership in agriculture’s heartland, he had opened a window to the Bay area in the retail and moving services arena. Quickly, I tapped into his allied moving services wrapping up the saga of Haddy’s wandering fate–securing her desired adoption. Today Haddy, the singing nightingale, is nesting in her new El Cerrito home after a safe and snug journey. Thank you Hans, Karen, and Irma for the collective effort! P.S. Miraculously, my pod is becoming a bit less treacherous under foot, with a few strategic keyboard shuffles. The space Haddy might have inhabited is now freed up for safe and easy access to the kitchen and bedroom. I will provide a good home for Haddy, she looks downright regal in the new space. Thanks Shirley. Thanks for the TLC.. and more.. I think you got rid of the wrong piano. Doesn’t that sound a lot like the type of piano Glenn Gould favored in the lower middle register? Anyway, that looks like just the sort of one that I would want. I said you got rid of the wrong piano, but I forgot that was only if you didn’t have other ones that were better. That must have been a really tough choice, like me trying to get rid of that superfluous equine. I know we have one, but which one? I enjoyed the Baldwin unboxing. I love the tone on that one. Is it easy to make each note sound articulated if you want to, on that piano? I thought I was cured of wanting a piano, but I guess not. I didn’t get rid of the piano. I have two grands and a digital.. so there is no room here for another piano. Haddy was given to a piano teacher when I moved to Berkeley, and she kept it for 2 plus years. 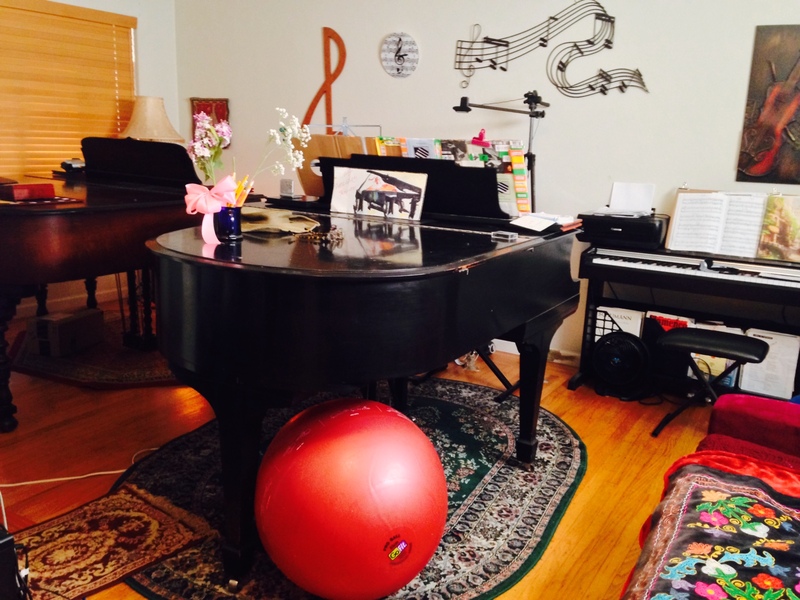 Now she has no space for two pianos, so it has gone to one of my piano students who needs a piano. It has a good home and I can visit it and play regularly as it’s now a short Bart ride away from my place. Yes, Baldwin and Steinway are both nice pianos…yes, I can articulate well on the Baldwin.